A Japanese proverb says that no man is stronger than a man with knowledge. Driven by desire for constant self-improvement, both personal and professional, a well-known therapist from Serbia, Peđa Filipović has recently found himself among a chosen few taking an international training course in moxibustion, an ancient method of Japanese and Chinese traditional medicine, which plays a significant role in prevention of diseases, but is also intended for therapeutic purposes. 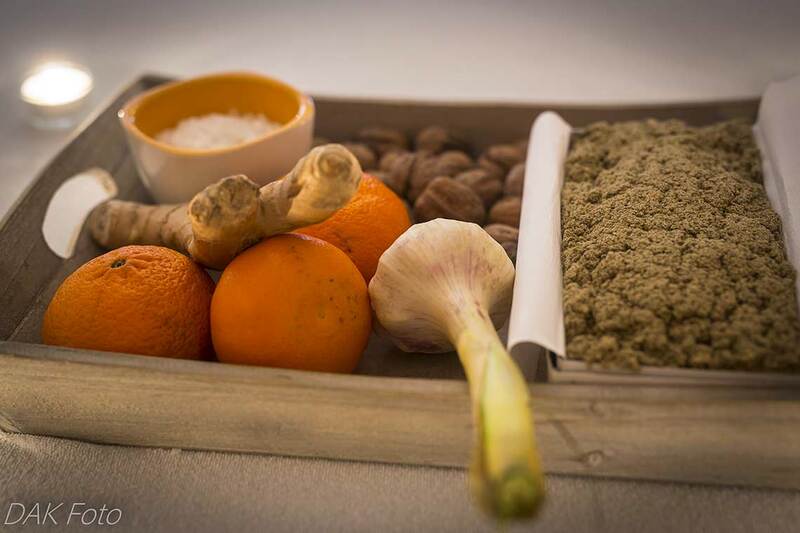 – Literal translation of ‘moxa’ would be “lighting refined herbs over the skin” (sometimes on the skin) –Peđa Filipović says. 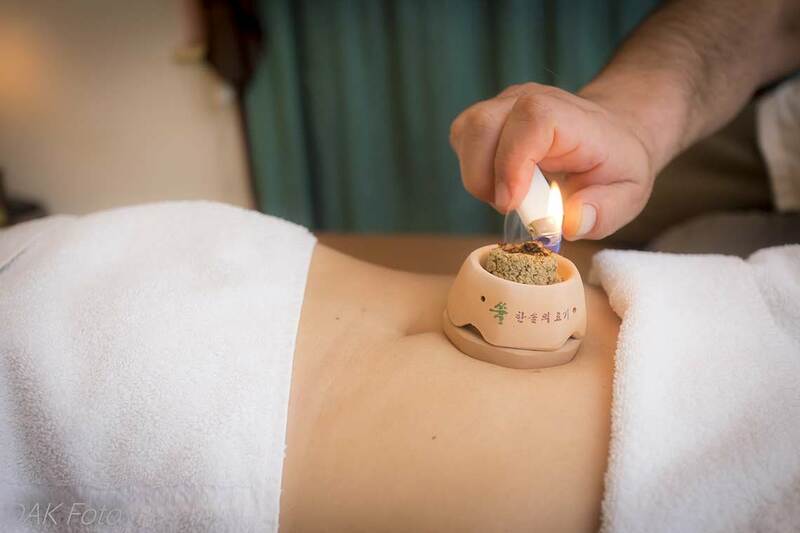 He is the only certified Japanese moxibustion therapist in Serbia. – We use wormwood for moxa, and they say that the best quality wormwood grows in Japan, while the one from China and other parts of the world is of a lesser quality. In parts of the world where it’s applied, moxa can be used in two ways, directly and indirectly. 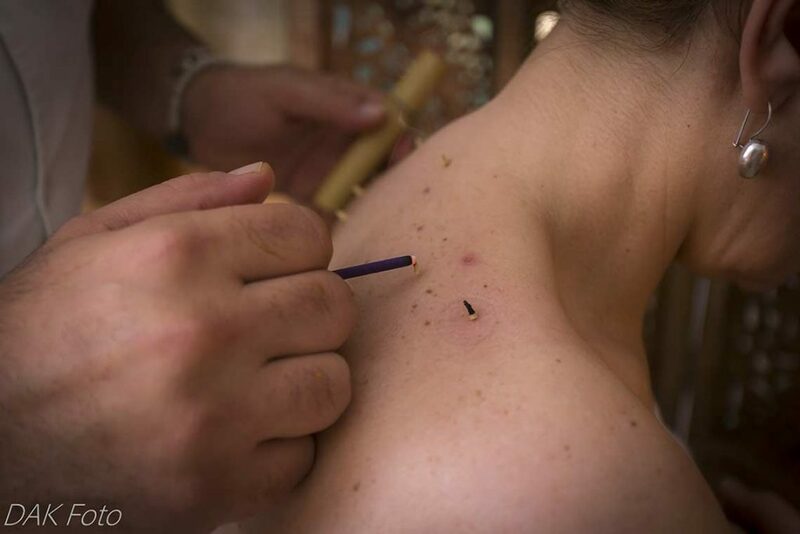 Peđa Filipović has learnt both direct and indirect Japanese moxibustion from an acupuncturist Merilyn Yang who has even created special moxibustion for people suffering from tuberculosis in South Africa. – With indirect moxibustion, refined wormwood is used in several different ways. Moxa stick looks like a Cuban cigar. The therapist lights it at a certain distance from the acupuncture points, tense muscles or sore spots, and heats it until pleasantly warm. Moxa treatment has an exceptional effect on people suffering from depression, anxiety, kidney problems, fluid retention etc. One of the great ways to apply moxa treatment is through the use of sea salt. 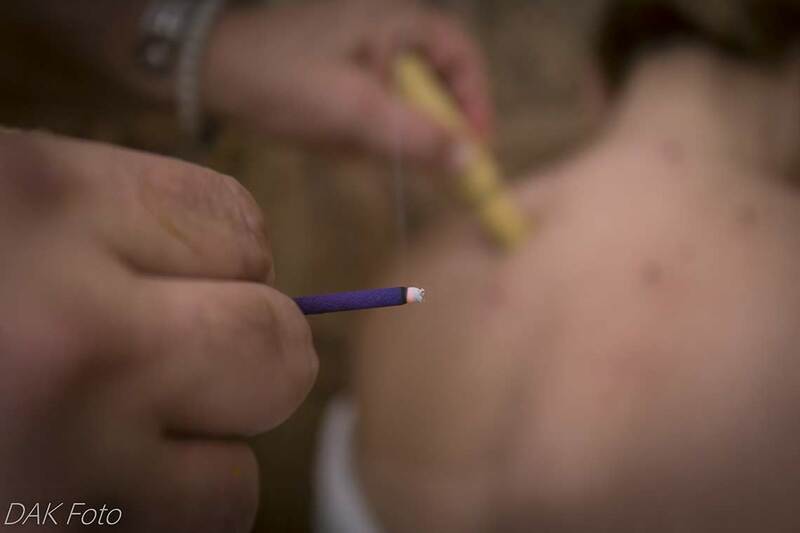 During the treatment, the salt serves as a foundation and is applied to the patient’s bellybutton, and the accumulated heat reaches the body through that spot, meridians and acupuncture points. 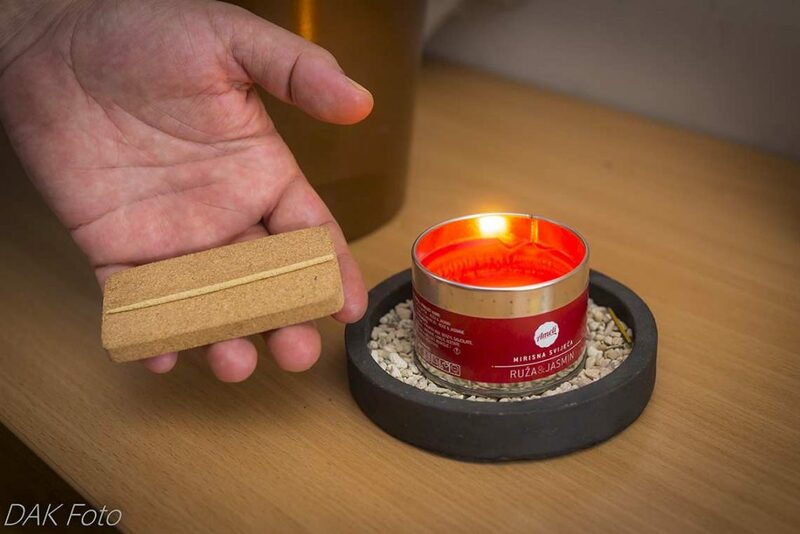 – Ginger is cut into 4mm-thick slices, and then placed on the salt, in which there has been made an opening with a toothpick and then moxa sticks are placed on top in a pyramid shape and lit. Burning together with ginger and salt, they slowly heat the meridians, restoring the natural balance of the body. The therapist coordinates the treatment, removing ginger with the sticks and leaving salt for a longer while. 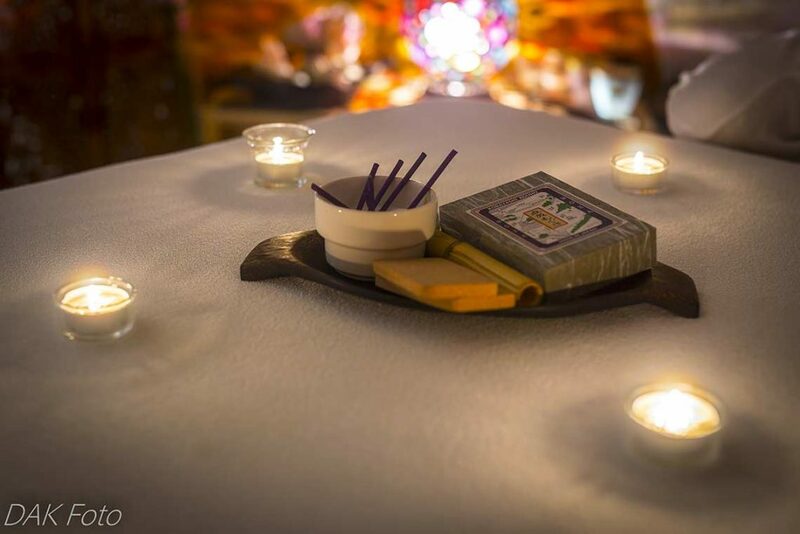 This can be a wonderful introduction to shiatsu and other treatments. 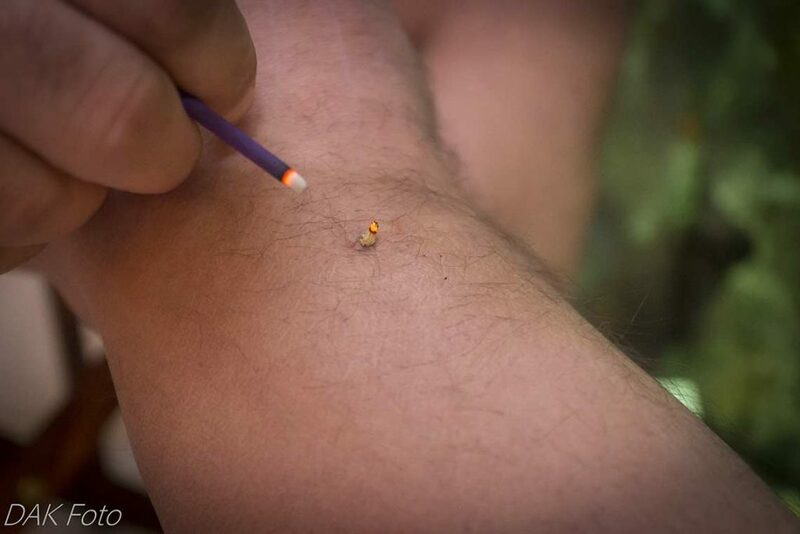 Tangerine skins can also be used; pieces of wormwood placed in them, lit them and applied to spots between the shoulder blades, where certain acupuncture points are located. This process relieves cough, breathing problems, pneumonia etc. Eye issues can be treated by placing moxa in a walnut shell, and having a trained therapist slowly heat it up. All over the world, moxa is used in a number of different combinations, including the one with garlic and miso paste. – There are also wooden containers for applying moxa, and those can be placed on sore spots that need ‘healing’ – Peđa Filipović said, showing us one such container. – Moxa used in Japan is of better quality and is more refined. Fibres found on wormwood leaves are collected and dried, and only when they are fully dry they can be used on acupuncture points. Wormwood is a source of many natural remedies. It grows in nature, and prefers the sandier soil. Moxa treatment isn’t painful at all – Peđa emphasizes, stating that the patient feels the warmth, but with certain applications, one only feels the heat afterwards. – Moxa treatments raise r leukocyte count, and are recommended to people undergoing chemotherapy. Wormwood contains healing substances: borneol, cineole, and tannin. 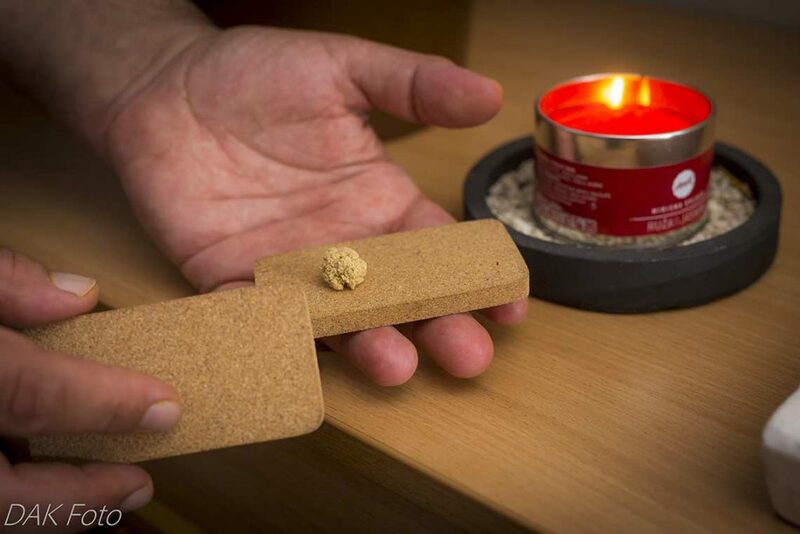 Smoke produced by burning the plant purifies the air and has no adverse effects. Moxa can be used to relieve stress. When using moderate heat, lymphocyte count also rises. Neck, head and loin areas should be warmed up, thus stimulating the immune system. Moderate heat should be applied to the sacrum and the neck, which directly stimulates the immune system. It also helps raise the lymphocyte count and improve overall health. 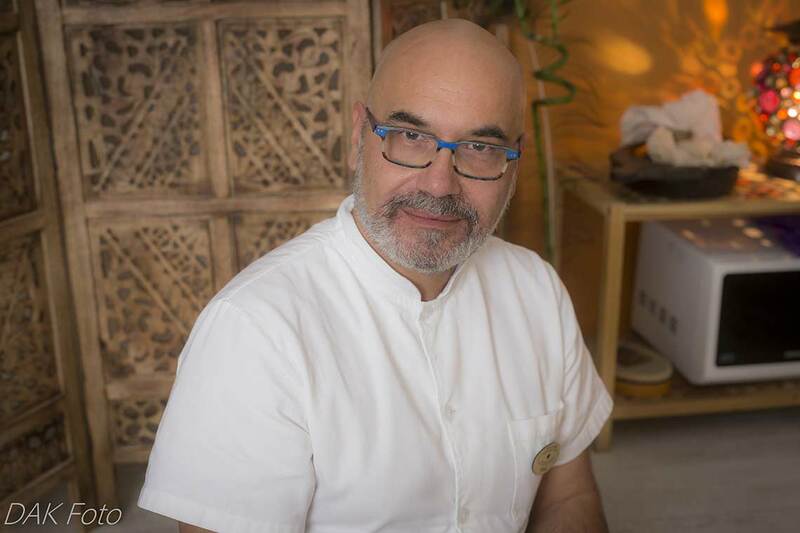 While constantly developing his expertise, Peđa Filipović says that moxa will be a part of the wellness concept he’s been working on for years. 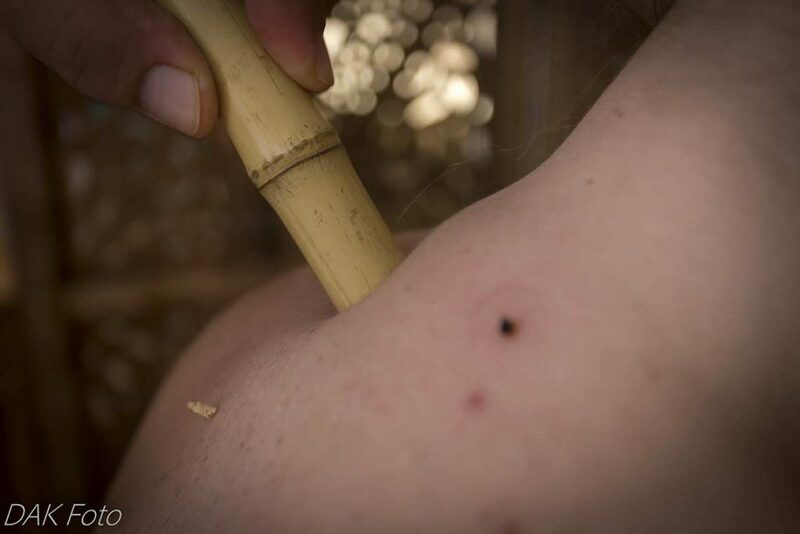 – Moxa is cheaper and older than acupuncture. It can help people keep their health, Peđa tells us, revealing the point on the leg that Chinese and Japanese gurus claim to be capable of ‘healing 3000 diseases’. – It is the “zu san li” point – or the “stomach 36”, and is also known as “the point of 3000 miles”. When stimulated, it creates balance in the entire body. They say that it is crucial for longevity, and it also for grounds the life energy. The entire moxa healing system has to do with grounding. The ‘stomach 36’ point can be found if you place 4 fingers on the outer bend of the knee; where the pinkie finger lands you should feel pain and that means you have found the point in question . Heating the meridians, thus eliminating the cold in the body, and moving the Qi energy through them, sets the circulation back in motion, increases the flow of Yang energy and supports the immune system – those are just a few of many moxa benefits. In Dalmatia, white sage is used instead of wormwood in such treatments. Peđa stresses that moxa treatments shouldn’t be carried out on children under the age of 4, women up to 5 months pregnant, people suffering from diabetes or leukaemia, or people with pacemakers, and varicose veins. – Moxa treatment is called ‘kyū’ in Japan, which means that someone is special and deserves respect. Moxa is of great importance over there. In the core of moxa stick, the heat may rise up to 500 degrees Celsius, but despite that Japanese moxa never burns skin.